The author addresses the principles of the subject from the viewpoint of modern processes, emphasising a general science narrative approach in the main text, with quantitative background derived in enabling ‘cookie’ appendices. 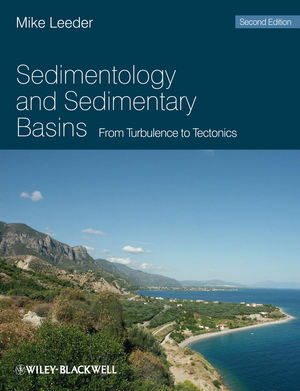 The book ends with an innovative chapter dealing with how sedimentology is currently informing a variety of cognate disciplines, from the timing and extent tectonic uplift to variations in palaeoclimate. Each chapter concludes with a detailed guide to key further reading leading to a large bibliography of over 2500 entries. The book is designed to reach an audience of senior undergraduate and graduate students and interested academic and industry professionals. Mike Leeder is Professor Emeritus at the University of East Anglia, Norwich, England. A geologist by training, at the University of Durham, he has researched and taught sedimentology since 1969, beginning as a graduate student at the Sedimentological Research Laboratory, University of Reading under the legendary Perce Allen and as faculty member at the Universities of Leeds and East Anglia. He is particularly interested in sedimentological fluid dynamics, basin analysis and the links between sedimentary processes and climate change.